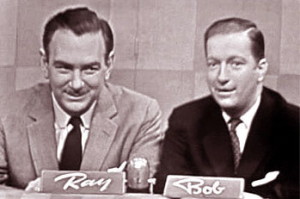 Bob Elliott, with his partner Ray Goulding, (at left), were the most durable broadcast comedy partnership in history. “Bob and Ray” got their start as a duo on WHDH-AM and went on to become stars on national radio and TV. They were the first humorists to perfect a style that was fully based in broadcasting, rather than drawing on stage, vaudeville or film. In radio, television, and advertising, Bob and Ray established and perfected a distinctive brand of humor – satiric, offbeat, absurdist, fertile, and incredibly creative – that lasted almost fifty years and inspired hundreds of others, from the phone interview style of Bob Newhart to The Firesign Theatre to “The Worst Person in the World,” later adopted by Keith Olbermann on MSNBC. Bob Elliott and Ray Goulding began as radio announcers (Elliott was a DJ, Goulding did the news) on WHDH-AM in the 1940’s. Each one would visit the other while on the air. Their informal banter was so appealing that WHDH decided to use them as a team to fill in when Red Sox broadcasts were rained out. They would improvise comedy routines all afternoon (no night games back then), and joke around with studio musicians. They went to New York in 1951 when the show went national on the NBC Network, including regular appearances on “The Today Show” with Dave Garroway, as well CBS and Mutual Networks and WINS, WHN, and WOR radio, later moving to NPR from 1976 to 1987. They also played the Piel Brothers, Bert and Harry, in the animated Piel’s Beer TV commercials in the 50s and 60s. Among their writers were Raymond Knight (Elliott later married Knight’s widow) and former WEEI big band singer Jack Beauvais. Wally Ballou, an inept news reporter, man-on-the-street interviewer, “and winner of over 7 international diction awards,” whose opening line almost invariably began with an “up-cut” before his microphone was live, as in… “–ly Ballou here.” In one of his broadcasts, he was discovered to have started early on purpose and was chewed out by the location engineer (Ray) for making it look as though the mistake was his. Tex Blaisdell, a drawling cowboy singer who also did rope tricks on the radio. Arthur Sturdley, an Arthur Godfrey take-off. Johnny Braddock, another sportscaster, but with an obnoxious streak. Kent Lyle Birdley, a wheezing, stammering old-time radio announcer. Peter Gorey, a character similar to Gore but with a Peter Lorre-type voice. He would typically appear as a news reporter, reading the same gruesome stories (“Three men were run over by a steamroller today…”) each time he appeared. Bob and Ray would also occasionally play a record of “Music! Music! Music!”, ostensibly sung by Gorey. Bob Elliott was born in Boston in 1923 and grew up in Winthrop. He had five children, including well-known actor and comedian Chris Elliott. He died in Cundy’s Harbor in Harpswell ME IN 2016 at the age of 92.